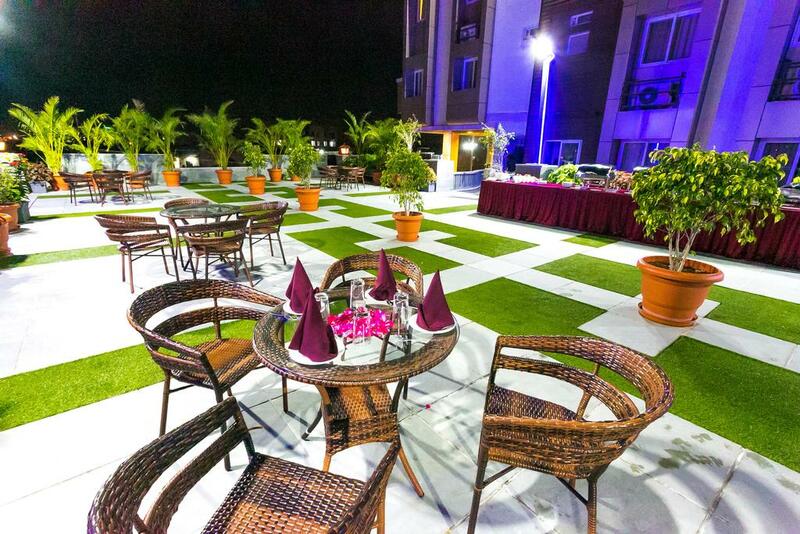 Hotel Ambience offers a great combination of Modern style and well equipped with modern amenities. If you are planning a visit to the city of lakes then it is one of the most prominent hotel for your stay. To pamper the guests with ultimate comfort, luxury and pleasure the hotel offers multifarious amenities and services. The ideal location and warm hospitality makes it a widely accepted hotel by all types of travelers. Our boutique hotel offers well appointed luxurious 57 rooms with, Banquet Hall, Swimming Pool,1 Lac sqft Garden, Multi Cuisine Restaurant & Coffee Shop and Health Club, which are gracefully decorated and furnished with all modern amenities.Appealing are our elegant and well furnished air-conditioned for comfort at its optimum.A hotel is an establishment that provides lodging paid on a short-term basis. It Is Located In Near Udaipur City Most Visited Place Celebration Mall. Complexes, And Within Very Easy Access To Airport And Railway Station. RO Water Purification System, Bar, Complimentary Newspapers in Lobby, Baggage Storage on Request, Major Credit Cards Accepted, ATM/Banking, Elevator/Lift, Travel Counter, Internet/Wi-Fi, Restaurant. Complimentary Newspaper, Reading Lamps, House Keeping, Window Opens, Wardrobe, Kitchenette, Air Conditioning Room, Daily Room Cleaning, Shoe Shine, Child Care. Bar, Secretarial Services, Room Service, Restaurant, Parking, Laundry Facilities, Doctor on Call, Conference Hall, Coffee Shop/Cafe, Business Facilities, Breakfast Services, Banquet Facilities, ATM/Banking. User reviews for "Ambience Hotel Udaipur"